Everything in life is temporary. So if things are going good, enjoy it because it won’t last forever. And if things are going bad, don’t worry. It can’t last forever either. 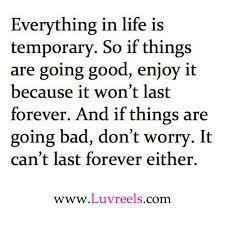 Quote : Everything in life is temporary. So if things are going good, enjoy it because it won’t last forever. And if things are going bad, don’t worry. It can’t last forever either.